Understand The Times International is a non-profit ministry registered in both the United States and Canada. It receives tax-deductible financial support through donations from individuals and churches, along with honoraria and sales of materials, all of which go directly towards proclaiming the gospel of Jesus Christ globally. Thank you for your donation to Understand The Times. Donors from the United States and Canada will be sent a year end receipt for tax purposes by mail. 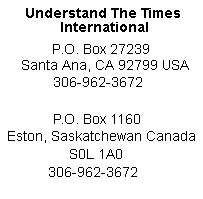 You can donate to Understand The Times, International online with a credit card or by mail with a check or money order. Donations can also be made with a credit card using our fax form below. All USA and International credit card donations are processed in our bank in the USA therefore these credit card donations are in US Dollars (USD). All Canadian credit card donations are processed in our bank in Canada therefore these credit card donations are in Canadian Dollars (CAD). Tax receipts will be issued at year end for all Canadian and US donors. Donors in the United States who would like to donate by credit card (Visa, MasterCard, American Express and Discovery) can fax Understand The Times at 714-957-3899 and provide us with the details of your card, the amount and the way you would like to donate. To donate by fax with a regular monthly gift or a one-time donation, please click on the Fax Machine below. When you go to that page, you will see an icon that says "Print This Page". Click on that icon and it will print the form on your printer. After printing the page and then filling it the blanks, please fax it to the number located on the Fax Transmittal form.